Northern Parula at Magee Marsh. Charcoal and Pastel Drawing by Ken Januski. Northern Parula at Magee Marsh. Pencil Drawing by Ken Januski. 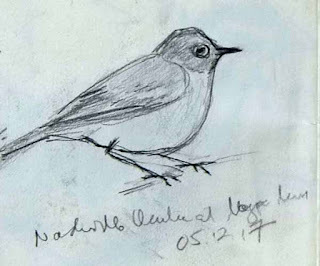 Northern Parula at Magee Marsh. 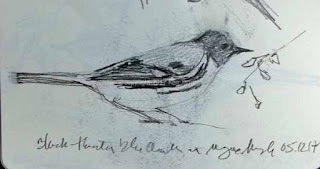 Pencil Field Sketch by Ken Januski. 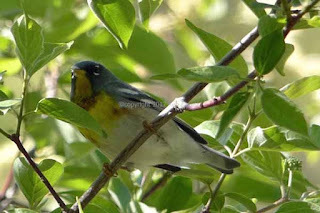 Northern Parula at Magee Marsh. Photo by Ken Januski. I recently spent over a week in the Magee Marsh area of Ohio with my wife. 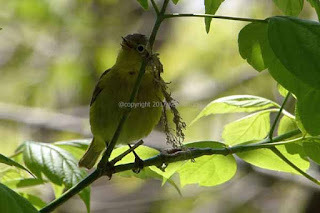 It is a great place to see warblers close up. But after a while you begin to suspect that warblers all have the same song: "click, click, click, clickclickclick". The sound of cameras drowns out the sound of the birds. It is that crowded and everyone seems to have a camera. It's easy to understand. They are such beautiful birds and only rarely can most people see them so close. So you want to capture them. It's a real temptation, and one I always fall to. But there's something bothersome about 'capturing' them via photography. It can seem a bit aggressive as well as possessive, like an object to be obtained rather than something to enjoy. Drawing them from life is far more difficult than pushing the button on a camera. But it's also far more engaging. So I always plan to do sketches of them from life and eventually I do so. 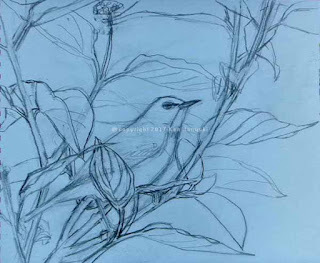 Such sketches are difficult because the birds move so quickly. At that time it almost seems criminal to reach for the sketchbook. 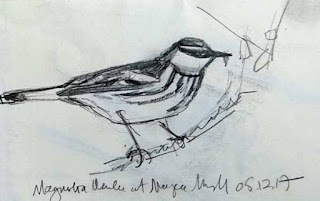 On the other hand it's also the only chance you may ever get to sketch them close up from life. I know that there will be problems with the sketches but I can't resist doing so. Many of them are shown here. I'm also including a number of photos, and also I hope a couple of videos. I think together that they give some sense of the full experience. Above you see three different representations of a Northern Parula along with a photo. Sometimes the warblers are so close you could literally reach out and grab them. 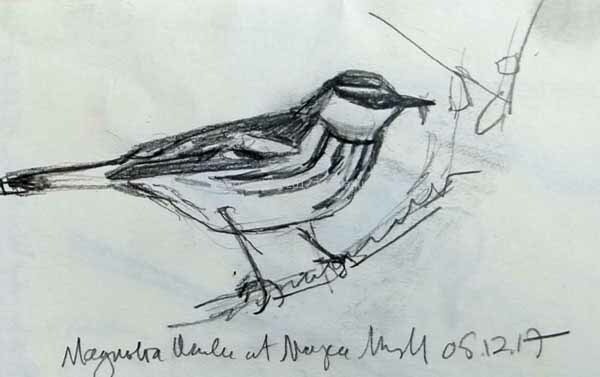 That certainly was the case for me with Pine, Black-throated Green, Chestnut-sided and Yellow Warblers. They were within my grasp. 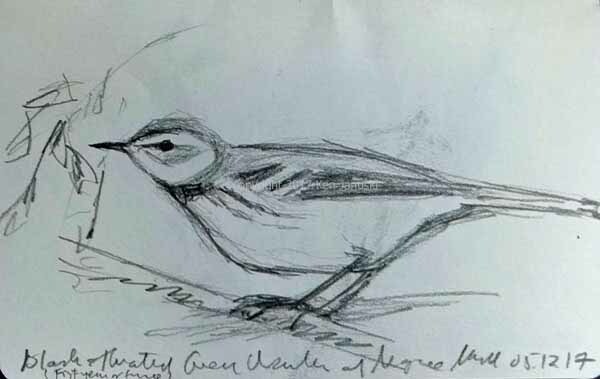 My thinking here is that though you can almost reach out and grab these warblers any art work based on them ought also to have that quality. The charcoal and pastel drawing at the top, done today two weeks after getting back from Magee, attempts just that. It attempts to capture the experience, not just copy a photo. 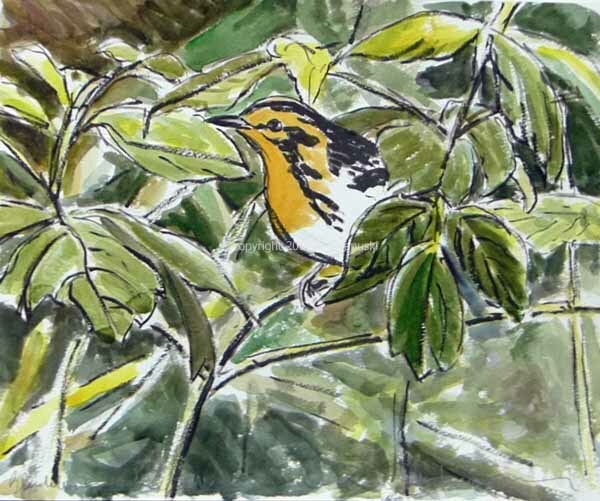 Blackburnian Warbler at Magee Marsh. Pencil Field Sketch by Ken Januski. Blackburnian Warbler at Magee Marsh. Brush Pen and Watercolor Painting by Ken Januski. 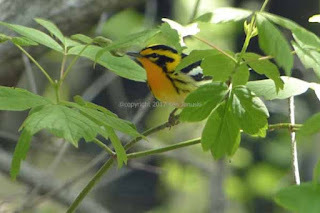 Blackburnian Warbler at Magee Marsh. Photo by Ken Januski. 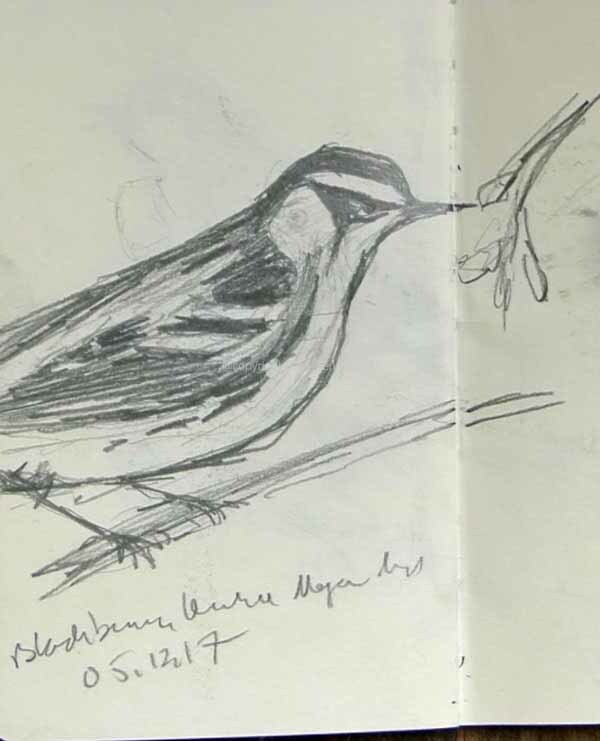 Below are a few more field sketches as well as photos of many of the other warblers seen at Magee Marsh. 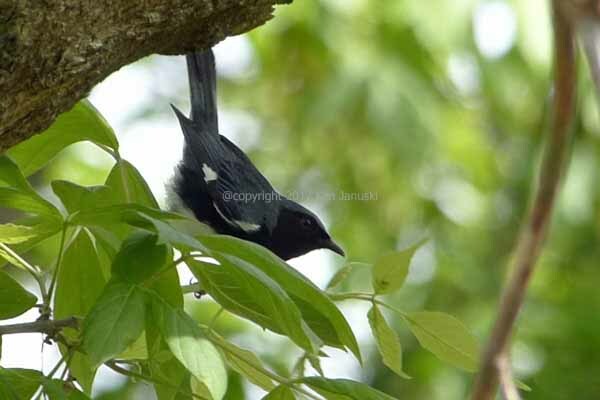 Black-throated Blue Warbler at Magee Marsh. 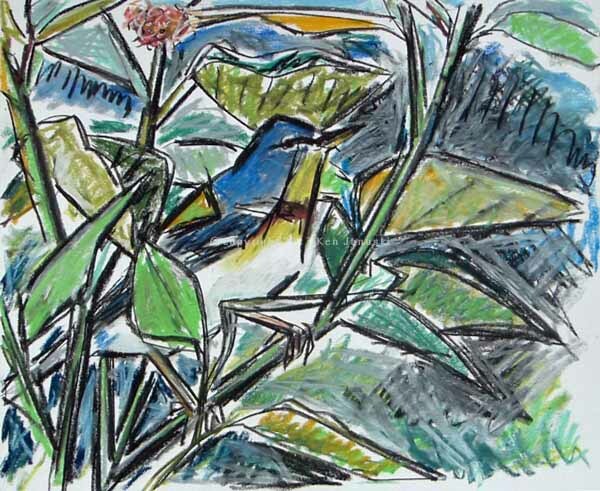 Pencil Field Sketch by Ken Januski. Black-throated Blue Warbler at Magee Marsh. Photo by Ken Januski. 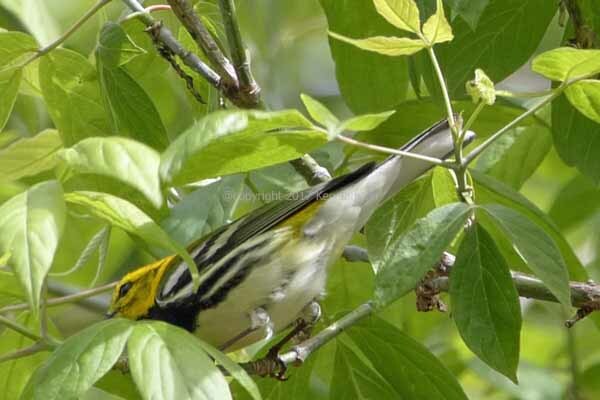 Black-throated Green Warbler at Magee Marsh. 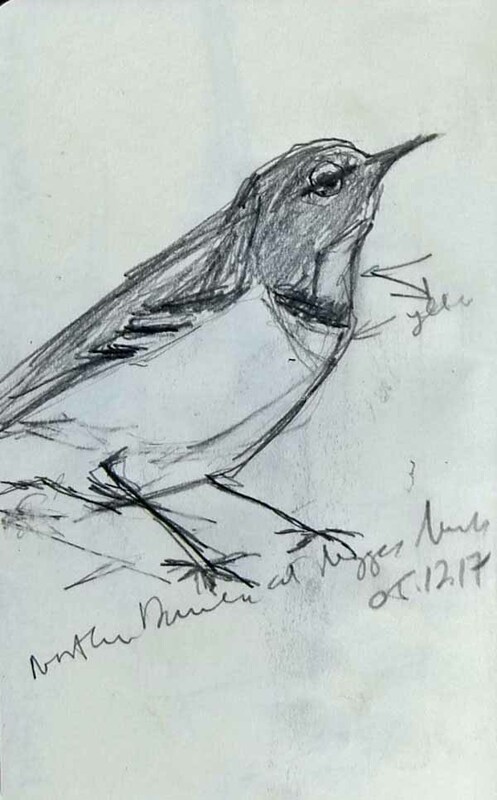 Pencil Field Sketch by Ken Januski. Black-throated Green Warbler at Magee Marsh. Photo by Ken Januski. 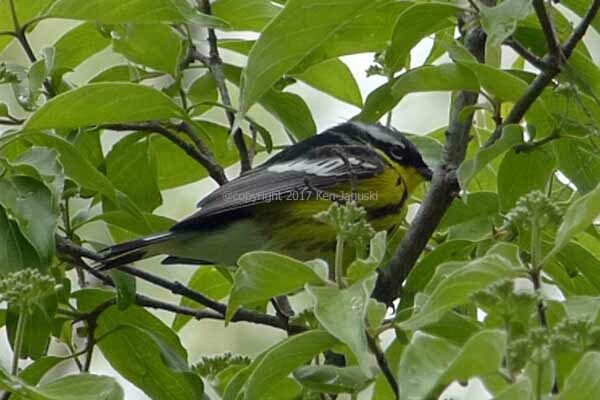 Magnolia Warbler at Magee Marsh. Pencil Field Sketch by Ken Januski. 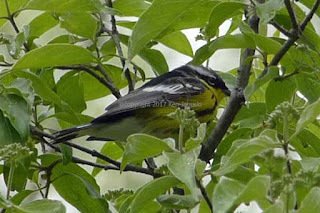 Magnolia Warbler at Magee Marsh. Photo by Ken Januski. Nashville Warbler at Magee Marsh. Pencil Field Sketch by Ken Januski. 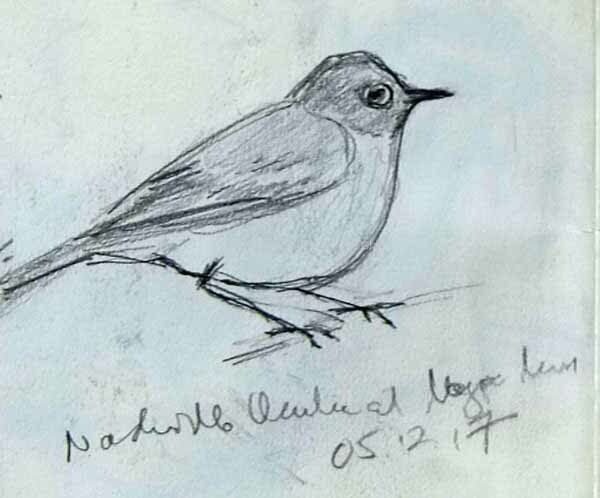 Nashville Warbler at Magee Marsh. Photo by Ken Januski. 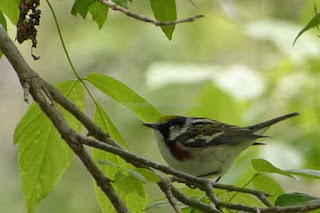 Chestnut-sided Warbler at Magee Marsh. Photo by Ken Januski. Though it is always exciting to see all of these warblers, and many other species, at Magee it often happens that as soon as we get home a bird that we'd gone on vacation specifically to see makes an appearance while we're out birding in Philadelphia. Such was the case with the first Prothonotary Warbler we've ever seen in Philadelphia. I found it less than two miles from home, along the Wissahickon Creek. He actually stayed around long enough for me to shoot a short video with my camera as well as take a number of photos. One of the reasons I like shooting videos, and only with my camera so the gear is simple, is that I can often get the song along with the bird. For me a bird is not a bird without his song. 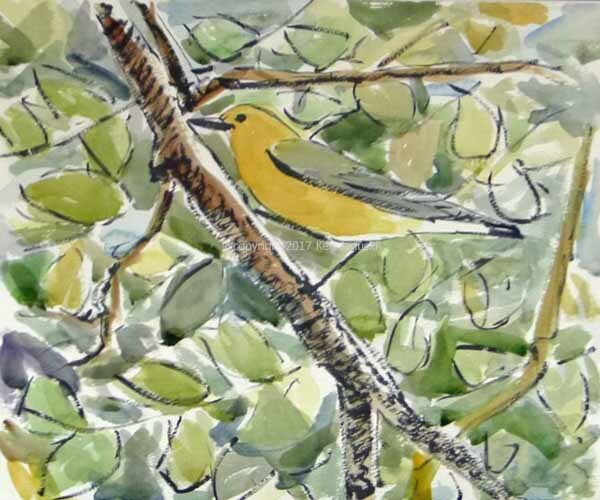 One problem I've had with Prothonotary Warblers is that though they are quite striking visually I find it difficult to make an interesting painting based on them. I think that this is due to the lack of pattern in their plumage. In any case I used this video as a springboard for my most successful version of a Prothonotary so far. Prothonotary Warbler at Wissahickon. Brush Pen and Watercolor Painting by Ken Januski. 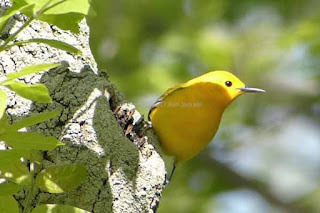 Prothonotary Warbler at Magee Marsh. Photo by Ken Januski. Finally I'd like to add something about the title of this post. When a warbler is close enough to grab in your hand you realize what tiny, fragile creatures they are. I like experiencing this. It helps to take them out of the 'cute' category and actually seem like the living things that they are. It also helps you realize how optics don't necessarily tell the truth about the world, neither through binoculars nor in photos. Things seem large, bold and detailed in both. But it often comes as a surprise to find out just how small those bold, beautiful warblers really are.